I have always wanted to go on a cruise, so I was very excited to see a Celebrity Cruises booth at the LA Travel Conference. Ryan has never really been interested, but he’s (almost) changed his tune after we took a closer look at some of the more exotic cruises that Celebrity has to offer. And while cruise ships are notorious for small rooms, the Celebrity ships look very nice and some of the rooms even look, dare I say, luxurious! Sure, you may pay a bit for a room with a view, but all things considered, cruises can be very cost effective. However, it wasn’t the rooms that we were so impressed with – it was the wide variety of options. We were particularly captivated by the South American, Panama Canal, and Asian cruises (which included stops in China, Singapore, Malaysia, Thailand, Indonesia, Vietnam, South Korea, and Japan). I’ve always associated cruising with some place tropical – namely Mexico or the Caribbean, since those seem to be the popular choices from LA and Florida. The idea of exploring a new place, but not committing to one or two cities, is an especially attractive characteristic of cruises. It’s hard to imagine only 8-10 hours in my favorite cities, but if I think about a cruise as a way to “scout” locations for future trips, it doesn’t seem so bad! Below is the route for one of the cruises that was really tempting – a South American cruise with stops in Antarctica! This particular cruise is 14 nights and starts in Argentina (Buenos Aires) before making two stops and then continuing on to Antarctica. The only catch is that there are no actual stops in Antarctica; instead the ship “cruises” by Schollart Channel, Paradise Bay, Gerlache Strait, and Elephant Island on days 7 and 8. 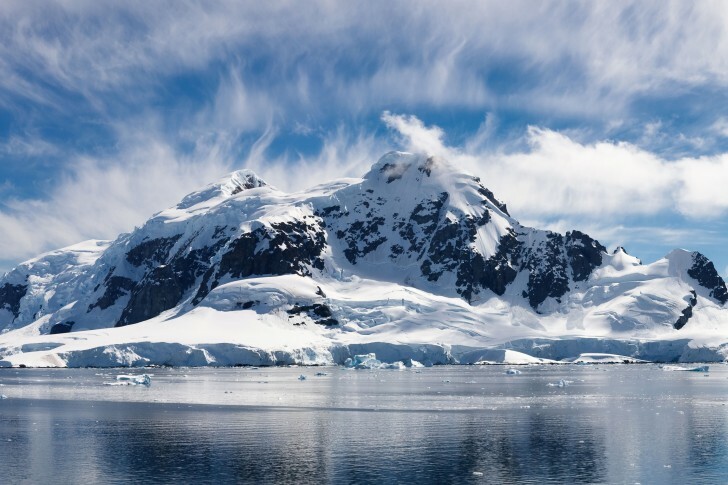 However, the views of Antarctica are breathtaking, even without stepping foot off of the boat. The picture below is of Elephant Bay (from here), and the real thing has to be much more amazing. I don’t know when I’ll be able to convince Ryan to go on a cruise, but this South American cruise is high on my list! This entry was posted in Travel, Travel Planning and tagged Antarctica, cruise, South America by Kristin. Bookmark the permalink.